A scintillatingly hot day matched by the quality of the artists on display. Special mention for the two main attractions, Post Malone and J. Cole, who, at times, seemed to have the crowd in the palm of their hands. Cast your mind back almost a month to Friday 6th July. England were still in the World Cup. The heatwave remained relatively fresh and enjoyable. Love Island was in full swing. 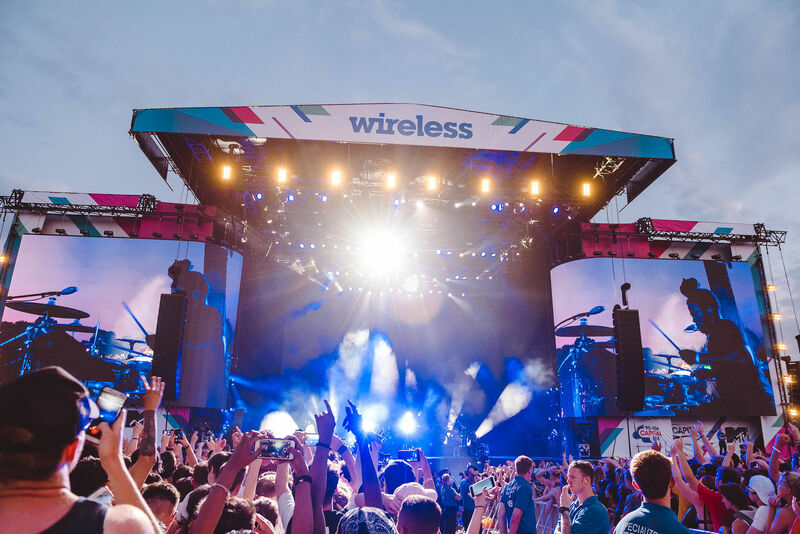 More importantly, Wireless Festival had once again set up shop in Finsbury Park for three days and nights of revelry. The line-up was stacked, the weather was set fair and this combination saw thousands of (mostly) young adolescents assemble in anticipation. With the talent split between the hulking Main stage and the more intimate Pepsi Max stage, the first challenge was to find an inch of shade to shelter from the baking 30-degree heat. Having negotiated leftover curly fries and half-eaten hot dogs, we achieved just that and turned our eyes towards the stage as the first acts began to emerge. The first half an hour possessed a distinctly pre-pubescent air with London youngsters AJ x Deno and EO performing their hit tracks ‘London’ and the phenomenally catchy ‘German’. The increasingly sweaty and red-faced crowds happily rapped along and Wireless Festival 2018 was underway. As the first acts were ferried back to their secondary schools (yes, they are that young), it was time to survey the mouth-watering food options available. Having wandered across the festival grounds, pondering on whether it would be jerk chicken, ostrich burgers or noodles for dinner, another young Londoner had taken to the stage. Although we missed most of his set, we did manage to catch Mostack‘s biggest hit, the heavily sampled ‘What I Wanna’ which once again stirred the crowd from their heat-induced stupor. As increasingly animated chants of ‘Football’s Coming Home’ began to float across the park grounds, the Godfather of Grime, Wiley, swaggered on to the stage to address an increasingly large crowd. Having speculated earlier as to whether the BBK member would play any of his catchier, pop crossover tracks, Wiley led off with the crowd pleasing ‘Too Many Man’, before following it up with ‘Heatwave’, ‘Wearing My Rolex’ and ‘Can You Hear Me?’ which triggered a full-on singalong, with the crowd now buzzing with energy. The peak of the Londoner’s set was achieved when he brought on special guest Lethal Bizzle who had the crowd eating from his palm with two of his catchiest hits, ‘Fester Skank’ and ‘POW’. Unfortunately, much of the momentum and hype built up by the first half was quickly eroded by a grime-heavy and rather dull second half which fizzled out disappointingly. 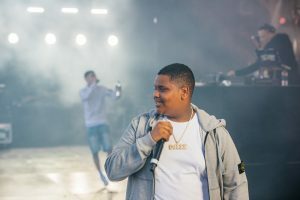 With the end of Wiley’s set, the main stage became the property of the United States with the four remaining headline acts hailing from across the Atlantic. First up was ‘special guest’ Big Sean who, to my friend’s surprise, is not very big. Performing an array of his biggest hits including ‘A$$’, ‘Blessings’, ‘My Last’ and ‘Bounce Back’ in front of a dark and imposing set, the US rapper delivered an accomplished yet uninspiring set which failed to spark an increasingly fatigued crowd. The next act to grace the main stage was Canadian R&B star PARTYNEXTDOOR who brought with him an extremely energetic guitarist and drummer and instantly commanded widespread shrieking and delirium from the large female sections of the audience. With the assistance of an autotuned microphone, the Toronto-born singer delivered a set stacked with most of his hits, although rather quickly it emerged that many of his most crowd-pleasing songs were either features or collaborations. Nonetheless, the crowd emerged content and drenched in sweat, alcohol and piss, all of which had at one point been flying around. As the time ticked past 8pm and news spread that France had knocked Uruguay out of the World Cup, a buzz began to spread around Finsbury Park. By this point, the crowd had received a second wave of energy and a palpable sense of anticipation and excitement emerged. The two biggest names of a star-studded line-up were about to hit the stage. First up was Post Malone. Swaggering onto the stage with a fag in his mouth and a full pint in hand, the trampy R&B superstar immediately set about charming the crowd. Beginning with an expletive ridden monologue about his love for London and England, he proceeded to mangle the ‘Football’s Coming Home’ chant but was instantly forgiven as he launched into a frenzied and outstanding rendition of his biggest hits. Particular highlights from his set were stirring performances of old favourites ‘White Iverson’ and ‘Go Flex’ and the moving and emotionally raw ‘I Fall Apart’ which got every single member of the audience singing along. By the time his final song ‘Congratulations’ came around, the crowd had fallen in love with the young Rockstar who seemingly could do no wrong. Therefore, as dusk fell and thoughts of sleep and rest began to permeate the vast crowd, the main attraction finally took his place on centre stage. 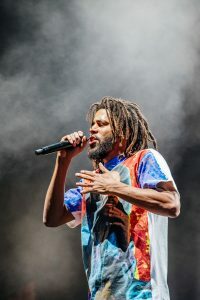 J. Cole has long-standing ties to both the UK and Wireless, having enjoyed great success and longstanding support from UK fans and having debuted in the UK at Wireless Festival when he had just released his first mixtape, The Warm Up. Appropriately, it did take some time for the North Carolina rapper to settle in, with the crowd reacting with lukewarm pleasure to his first couple of tracks. However, hype began to grow as Cole delivered two tracks from his new album KOD with a ferocity and assurance which appeared to rapidly snap the crowd from its premature slumber. Building on this momentum, Cole then proceeded to fly through the middle section of his set, streaming off hits such as ‘Neighbors’ and ‘Motiv8’ before delving into his past and conjuring up two crowd favourites in the form of ‘Work Out’ and ‘Can’t Get Enough’. With swathes of the audience now pumped up and in full-on party mood, it was time for the US rapper’s final stretch – a mini-set which included four of his biggest hits. Kicking off with the corny yet brilliant ‘Wet Dreamz’, which had the crowd singing along instantly, he swiftly moved on to the defiant, ebullient ‘G.O.M.D’ before once more inducing the crowd into a sing-along in the shape of his triumphant R&B collaboration with US crooner Miguel, ‘Power Trip’. For a brief, forlorn second it appeared as if J. Cole’s set had finished without a rendition of his biggest hit. Would he really deprive us of ‘No Role Modelz’? The answer, resoundingly, was no. As the first notes of the track hit, pure delirium spread across the crowd and carried on for the entire four minute duration of the day’s finale. With one final thank you from J. Cole, the opening day of Wireless had reached its conclusion. And what a day it had been.